Some people love memory foam pillows. Other people love plush gel pillows. Regardless of which camp you’re in, don’t worry because we’ve got you covered. We’ve scoured Amazon and tested about a dozen different pillows, and we’ve found the best among them. If you’re into shredded memory foam, the Xtreme Comforts Slim Hypoallergenic Shredded Certipur Memory Foam Pillow is the cream of the crop. And if you prefer gel, definitely check out the Beckham Hotel Collection Gel Pillow. Either way, you can’t go wrong! “THE BEST BED PILLOW” ★ RATED #1 by THE WIRECUTTER a well respected independent review organization – A THINNER VERSION of our famous traditional pillow. 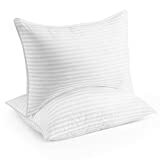 FOR STOMACH SLEEPERS or those who simply prefer a thinner pillow!MADE IN THE USA – DON”T BE FOOLED => Cheaper shredded memory foam pillows made in other countries do not meet important standards. – THIS MEANS A LOT when you are spending 8 hours a day sleeping on a product.